To thank everyone for joining my Authors After Dark 2012 New Orleans Reading Challenge over the past year, I'm giving away one book (valued up to $20) from Amazon or Book Depository. Simply fill out the Rafflecopter form below. Also, remember that the 2012 Challenge ends 12/31/2012. If you have any reviews, you may want to link them. There may be a surprise contest of some sort! 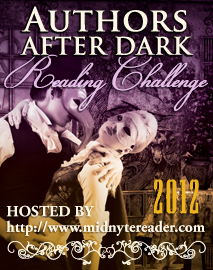 To enter, you MUST already be signed up for my 2012 Authors After Dark NOLA Reading Challenge as of this post (December 3, 2012). If you enter the contest and are not signed up for the above mentioned challenge, you will be disqualified. You are only signed up to the above mentioned challenge if your entry leads to a blog post about the challenge (not just your blog), or leads to a Goodreads or Facebook page regarding the Challenge. ~1 Book valued up to $20.00 from Amazon or The Book Depository. ~Contest ends on Sunday, December 9th, 2012 at 12:01 a.m.
~Again, to enter this contest, you MUST be signed up for my 2012 Authors After Dark NOLA Reading Challenge as of this post - today's date 12/3/2012. This was an awesome challenge. I enjoyed doing it. Like the snow in the background. 2012 AADNOLA Reading Challenge Winners! Top 10 in 2012 - Best Book Boyfriends of 2012. Top 10 in 2012 - Best Book Covers of 2012. A Conversation with Stephen King.